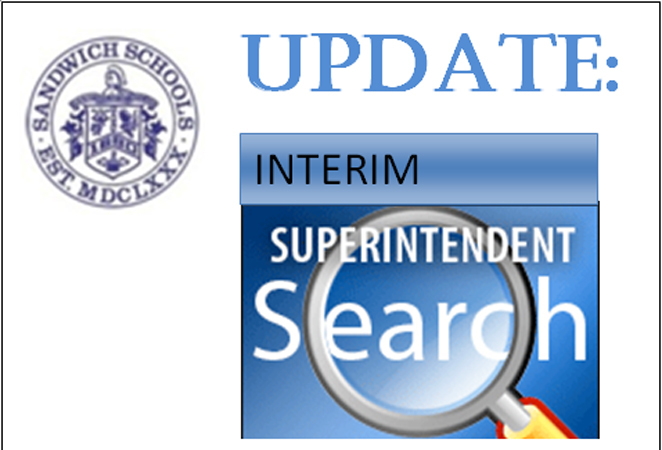 Update: Interviews for Interim Superintendent on Saturday at SHS! Posted on April 27, 2016 by Sandwich Learns Together/ SPS in Did you know? On April 25, 2016, School Committee member Stephanie Hall provided a press release regarding the plans for the Interviews for the Interim Superintendent. Since that time, there has been a change of location for the interviews. The press release follows, with the changes included. This School Committee meeting on Saturday is open to the public and will be taped for later broadcast by Sandwich Community TV. It will be broadcast on Channel 14 and online at www.sandwichcommunitytv.org. There will be no public forum available during this meeting. Many thanks to the Sandwich School Committee, Sandwich Community TV, the Sandwich Enterprise, Sandwich Schools Administration, teachers, staff, parents and all community members who have participated in the search process to date. Join us Saturday at the Sandwich High School Library!